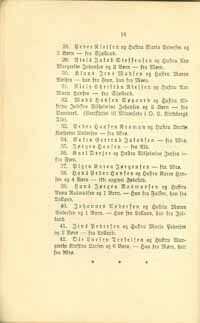 Transcribed below is the Elk Horn Church member list found on pages 16-18 of Elk Horn in Iowa 1875 - 1900, a 54 page softcover book published in 1901 by Danish Lutheran Publishing House in Blair, Nebraska. 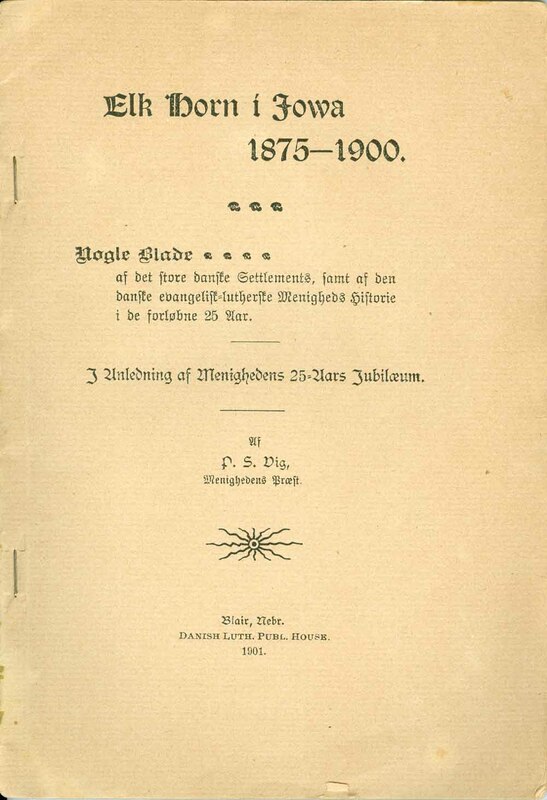 The book appears to have been published in celebration of the Elk Horn Church's 25th Anniversary, and was written in Danish and printed in a Gothic type which is unfamiliar to most readers today. Church records indicate there have been 42 members of the congregation, mostly made up of family fathers. It's difficult to tell who has been with the congregation from the first, so all 42 members and their families are listed. 1. Kristen Pedersen Madsen and wife Kirsten Albertsen - and 6 children - from Aero. 2. Hans Christensen Pedersen Rasmussen and wife Kathrine Maria Rasmussen and 4 children - from Aero. 3. Ole Larsen Olsen and wife Maria Kathrine Pedersen and 2 children - from Aero. 4. Rasmus Hansen and wife Karen Hansen Midtlien and 2 children - from Moen and Norway. 5. Jorgen Jensen and wife Ane Margrethe Johansen and 4 children - from Moen. 6. 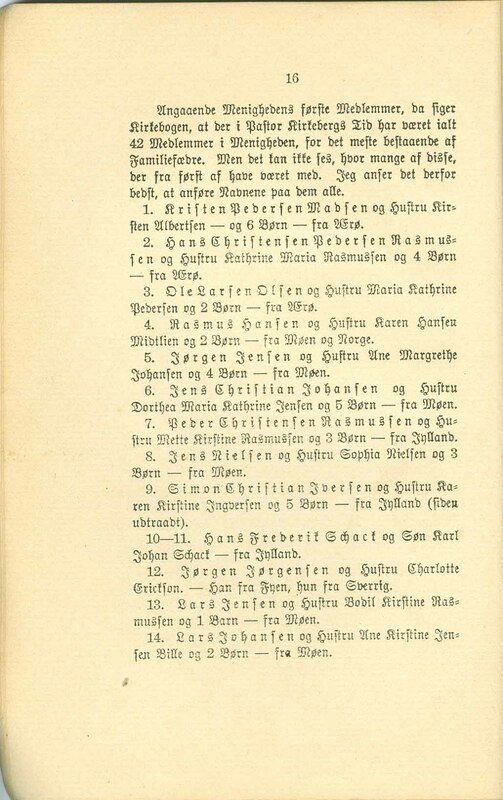 Jens Christian Johansen and wife Dorthea Maria Kathrine Jensen and 5 children - from Moen. 7. Peder Christensen Rasmussen and wife Mette Kirstine Rasmussen and 3 children - from Jylland. 8. Jen Nielsen and wife Sophia Nielsen and 3 children - from Moen. 9. Simon Christian Iversen and wife Karen Kirstine Ingversen and 5 children - from Jylland. 10-11. Hans Frederik Schack and Son Karl Johan Schack - from Jylland. 12. Jorgen Jorgensen and wife Charlotte Erickson. - her from Fyen, he from Sverrig. 13. Lars Jensen and wife Bodil Kirstine Rasmussen and 1 child - from Moen. 14. Lars Johansen and wife Ane Kirstine Jensen Bille and 2 children - from Moen. 15. Lars Jensen and wife Bodil Kristine Jensen and 2 children - from Moen. 16. Hans Pedersen and wife Maren Margrethe Knudsdatter and 1 child - from Moen (since ruled the Church?). 17. Niels Peder Pedersen and wife Marthea Maria Johansen and 2 children - her from Lolland, he from Norway. 19. Niels Peder Esbeck and wife Inger Jensine Bertha Nicoline Peterson and 1 child - from Jylland. 20. Niels Peterson and wife Maren Kirstine Markussen. - her from Sverrig, he from Sjaelland. 21. Peder Nielsen Clausen and wife Magdalene Pauline Petersen - from Aero. 22. Niels Andersen and wife Karen Marie Hansen and 2 children - from Sjaelland. 23. Hans Nielsen and wife Christiane Larsen - from Lolland. 24. Andreas Andreasen Naetvig and wife Sigrid Thomasdatter Laegred and 1 child - from Norway. 25. Jorgen Andreasen Notvig and wife Sella Eriksdatter and 2 children -- from Norway (?later left - ?? ?senere ud-traadt). 26. 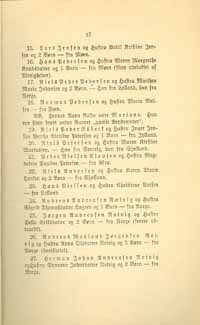 Andreas Mosland Jorgensen Notvig and wife Anna Olsdatter Notvig and 3 children - from Norway (?moved - ??bortflyttet). 27. Herman Johan Andreasen Notvig and wife Synnova Johnsdatter Notvig and 2 children - from Norway. 28. Peder Nielsen and wife Maria Pedersen and 3 children - from Sjaelland. 29. Niels Jakob Steffensen and wife Ane Margrethe Johansen and 2 children - from Moen. 30. Klaus Jens Madsen and wife Maren Nielsen - her from Fyen, he from Moen. 31. Niels Christan Nielsen and wife Ane Marie Hansen - from Sjaelland. 32. Mads Hansen Sogaard and wife Elfrida Josefine Wilhelmine Johansen and 2 children - from Denmark. (? ?moved away to Minnesota in O. L. Church's time? - bortflyttet til minnesota i o. l. kirkebergs tid). 32. Peder Hansen Kroman and wife Berthe Kathrine Andersen - from Aero. 34. Widow Gertrud Jakobsen - from Aero. 35. Jorgen Hansen - from Als. 36. Karl Drejer and wife Wilhelmine Jensen from Fyen. 37. Girl Karen Jorgensen - from Aero. 39. Hans Jorgen Rasmussen and wife Anna Rasmussen and 1 child. - her from Falster, he from Lolland. 40. Johannes Andersen and wife Maren Andersen and 1 child. - her from Lolland, he from Jylland. 41. Jens Pedersen and wife Maria Pedersen and 2 children - from Lolland. 42. Ole Larsen Terkelsen and wife Margrethe Kirstine Larsen and 6 children. - her from Moen, he from Aero. 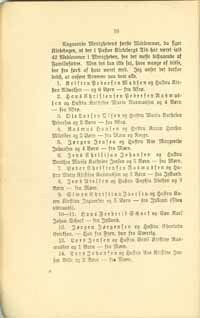 *NOTE: There were two #32 entries in the original list, and those entries have been transcribed exactly as they appeared. Please notify the County Coordinator of any translation/transcription errors. 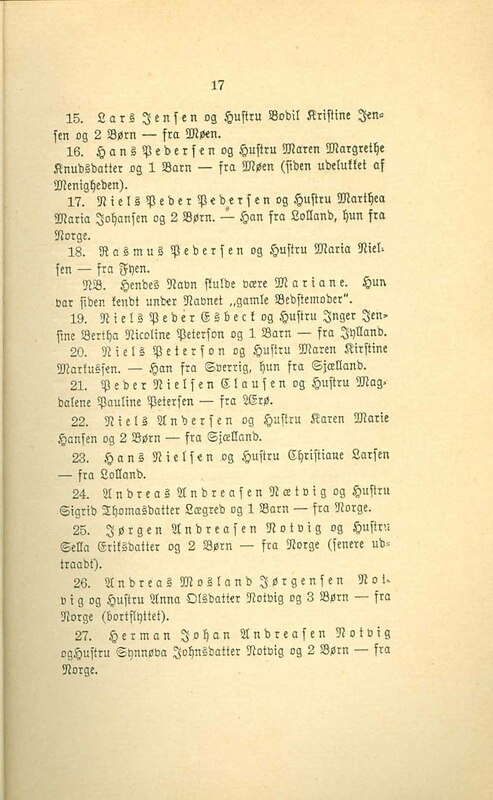 We hope to eventually transcribe this entire book, as many more pages reference individuals within the congregation. 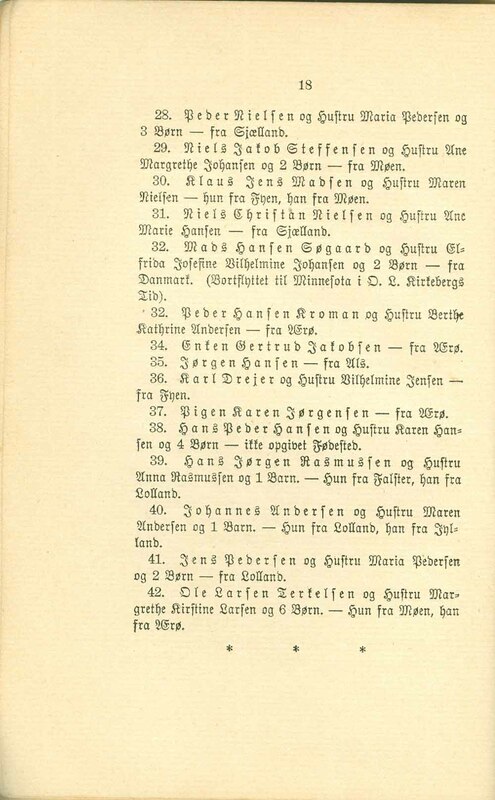 If you can read Danish and Gothic type and would like to assist with the translation and transcription effort please contact the County Coordinator. 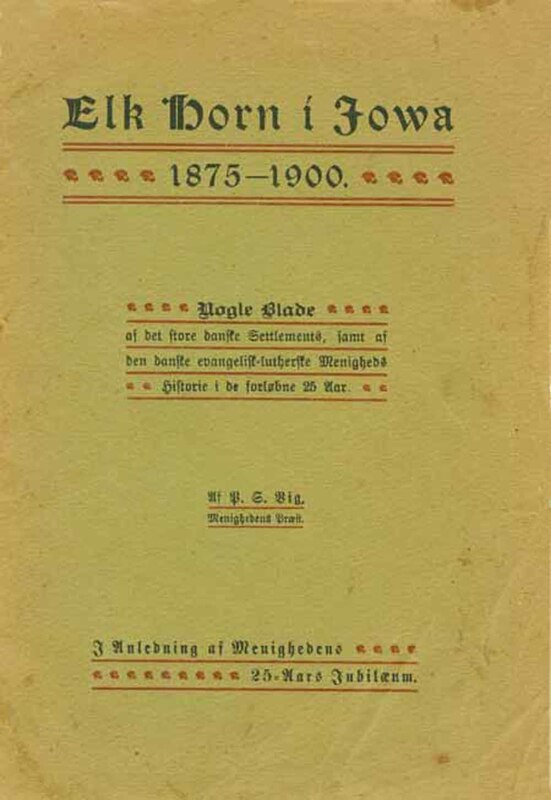 Transcribed by Cheryl Siebrass from "Elk Horn in Iowa 1875 - 1900", Blair, Nebr: Danish Lutheran Publishing House, 1901, pg. 16-18.